Jammu: Jammu and Kashmir Governor Satya Pal Malik, who is also Chairman of the Shri Amarnathji Shrine Board (SASB), presided over the 36th Board Meeting held today at Raj Bhavan, Jammu. The meeting was attended by BVR Subrahmanyam, Chief Secretary and Members of the Board including Swami Avdheshanand Giri Ji Maharaj; Shri D.C. Raina; Pt. Bhajan Sopori; Prof. Anita Billawaria; Dr. Sudershan Kumar; Dr. C.M. Seth; Tripta Dhawan and Prof. Vishwamurti Shastri. K.K Sharma, Consultant Yatri Welfare, Shri Amarnathji Shrine Board also participated in the meeting as a special invitee. Shri Umang Narula, Chief Executive Officer; Anup Kumar Soni, Additional Chief Executive Officer; and other senior officers of the Shrine Board also attended the meeting. Regarding the duration and date of commencement of Yatra 2019, based on the approach set out by the Sri Sri Ravi Shankar Committee, which had been set up to advise the Board regarding the duration and schedule of future Yatras, the Board, keeping in view the foremost concern of the safety and security of the pilgrims, decided that a 46 day Yatra would commence on 1st July, 2019, an auspicious day of Masik Shivratri as per Hindu Calendar and conclude on Shravan Purnima (Raksha Bandhan) on 15th August, 2019. The Board deliberated at length on the number of Yatris who would be allowed to register, date-wise and route-wise, for this year’s Yatra. 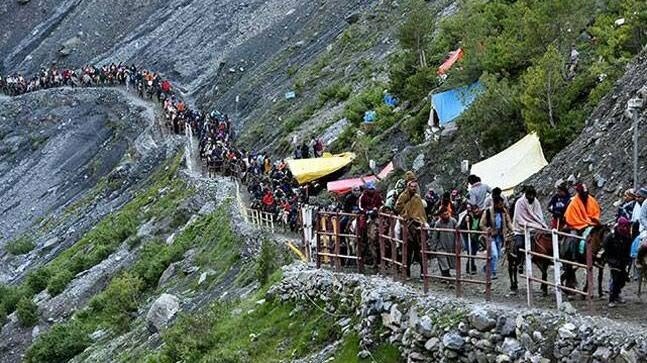 Considering the carrying capacity of the existing tracks and other available infrastructure in the Yatra area, the Board decided that 7,500 Yatris, per day per each of the two routes, excluding Yatris who would travel by helicopters, would be allowed to secure Advance Registration for the pilgrimage. Board noted the steps taken by CEO for the registration of pilgrims through 440 designated branches of Punjab National Bank, Jammu and Kashmir Bank and YES Bank, located in 32 States and UTs, and directed him to take all required steps to commence Advance Registration of pilgrims w.e.f. from 1st April 2019. The Board approved proposal for Online Registration of limited number of intending pilgrims per day on pilot basis which will be in addition to the existing modes of Registration. Board further directed wide publicity be given through the electronic and print media, informing the intending Yatris to timely secure the prescribed Compulsory Health Certificates issued by the Doctors/ Hospitals nominated by the State or UTs in which they reside and only thereafter proceed to seek Advance Registration from the nearest located designated Bank which would issue the pilgrim a Yatra Permit which shall be valid for the specified date and route. Board also advised CEO to appeal to all the potential pilgrims to consult their doctors before embarking on the pilgrimage. CEO shall also widely publicize that no person below the age of 13 years and above the age of 75 years shall be permitted to undertake the pilgrimage. The Board directed CEO to take timely steps for ensuring uninterrupted telecom connectivity in the Yatra area during Yatra 2019. Appreciating the important services rendered by the Langar Organizations, the Board looked to their continued support during Yatra 2018. The Board directed CEO to caution all potential pilgrims to particularly take into account the difficult climate and terrain in the high altitude region of the Yatra and prepare themselves fully before embarking on the pilgrimage. The Board also requested the intending pilgrims to make themselves physically fit for the arduous Yatra by taking regular walk and exercise. As in the past, the awareness campaign would be launched with the cooperation and support of the Ministry of Information and Broadcasting and all information relating to Yatra will be placed on the Board’s Website (www.Shriamarnathjishrine.com). Noting the Chairman’s direction for sustained efforts being made to further improve the facilities to be provided to the pilgrims this year, the Board reviewed the Action Plan drawn up for the conduct of Yatra 2019, particularly the arrangements which are being made for providing medical care, sanitation facilities, installation of the railings at all vulnerable points along each of the two routes, measures being take to preserve the environment of the Yatra area by ensuring removal of garbage in a scientific and environment friendly manner.